Debates over the proper role of government in energy innovation tend to get mired in stale tropes like “market failure,” “the valley of death,” and “picking winners and losers.” As a remedy, this volume is an effort to provide a foundation for improved public discussions and political debate. 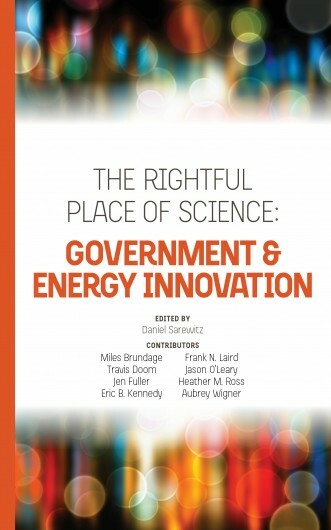 The cases in this book explore a variety of energy technologies and how they were developed, offering insight into complex innovation processes and the role of government. Ranging from solar to aeroderivative gas turbines, the book’s cases make clear why energy innovation is complicated, why progress is often slow and unpredictable, why mistakes and failures are inescapable—and why the role of government is essential. Daniel Sarewitz is co-director of the Consortium for Science, Policy & Outcomes and Professor of Science and Society at Arizona State University. His most recent book is The Techno-Human Condition (co-authored with Braden Allenby). Miles Brundage is a Ph.D. student in Human and Social Dimensions of Science and Technology at Arizona State University. His research focuses on the societal implications of artificial intelligence, robotics, and energy technologies. Travis Doom earned his undergraduate degree in engineering at Arizona State University. He spent the last several years with the Consortium for Science, Policy & Outcomes office in Washington, DC, working across a wide range of science and technology policy issues. Jen Fuller is a Ph.D. candidate in the Environmental Social Science program at Arizona State University. She currently thinks and writes about the social, political, and cultural dynamics of community renewable energy. Eric B. Kennedy is a Ph.D. student at the Consortium for Science, Policy & Outcomes at Arizona State University. His research focuses on fostering collaboration in solving complex & interdisciplinary real world problems. Frank N. Laird is associate professor and director of the International Studies degree at the Josef Korbel School of International Studies at the University of Denver. His publications include Solar Energy, Technology Policy, and Institutional Values and numerous journal articles. Jason O’Leary is a doctoral student in the Human and Social Dimensions of Science and Technology program at Arizona State University. He is also a graduate scholar at the NSF-DOE Engineering Research Center, Quantum Energy and Sustainable Solar Technologies. Heather M. Ross, DNP, is an adult nurse practitioner with a specialized focus in cardiac arrhythmias and implanted devices. She is a Ph.D. student at Arizona State University and a faculty member at ASU’s College of Nursing and Health Innovation, Center for Sustainable Health, and Professional Masters in Science and Technology Policy programs. Aubrey Wigner is a Ph.D. student in Human and Social Dimensions of Science and Technology at Arizona State University. His research focuses on integrating makerspaces and hackerspaces with higher education to enhance learning through hands-on interdisciplinary practices.